This is a 6 channel LED flasher controller designed for use in RC model planes. It is a small light weight circuit board with pads that you solder LED wiring to. A servo lead plugs into a spare RC channel for control. Designed to control LED lighting on RC planes, it can be used to flash LEDs or with external switching, any lights. It is programmable to select one of 5 predefined flash patterns. The selected pattern is remembered until changed. Similar to typical ESC programming. Each controlled LED output can safely switch up to 500mA safely. DO NOT short circuit the outputs to the +V supply – IT WILL blow the output. Landing Lights can be bright-directional and pointing forward so that they are most visible when flying towards the pilot. The Steady-ON output drives red and green navigation lights on the wing tips. The Beacon output provides slow flashing lights on the top and bottom of the fuselage. The 2 and 3 pulse Strobe outputs can provide additional visibility LEDs placed on wings or fuselage. The 1-pulse Strobe drives a super-bright white LED on the tail facing to be seen from all directions, or to the rear for safety from behind. Channel-6 also functions as the programming indicator for setting the flash pattern when you cannot see the LED on the circuit board. See below. 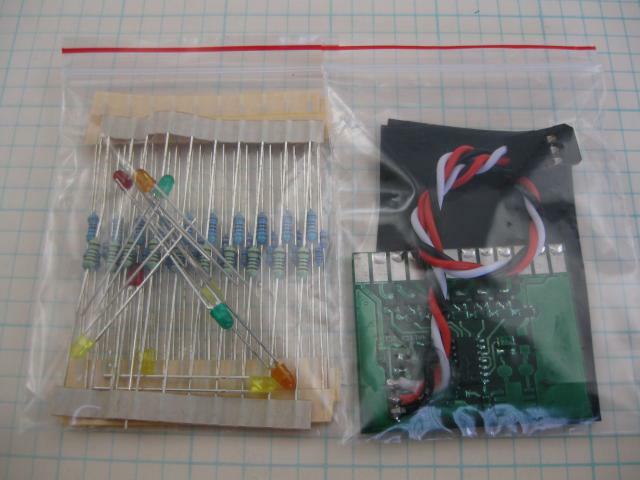 The LEDs will need resistors wired in series to limit the current and balance the brightness. Brighter works better during the day, but no LEDs are very effective in daylight. At dusk and night the LEDs become very effective and if too bright will make them all merge into one spot at a distance. The PPM control allows various modes to be selected while flying. All lights off, wing-tips only, minimal lights and strobes for general flying and visibility and all lights on for maximum visibility when returning and landing. For FPV flying visibility is important especially in dull conditions, at dusk or for night flying. The pilot needs to be able to see the plane, to locate it quickly and know the orientation. With the LED controller installed and resistors and LEDs set up not to be too bright it is possible to fly the plane visually in the dark. The RC control allows the LEDs to be turned off when you don’t want to be seen or all on for maximum visibility when landing. Between the FPV system and the LED arrangement confidence and safety can be greatly improved. When the LED lighting is for orientation and flight visibility rather than bright display effect, the LED brightness will be much less and power consumed is much lower. This allows the LEDs as well as the controller to be powered from the receiver 5 Volt just as a servo would be. Strobes can still be bright with a low average current draw. See our LED strobe adaptor. Be sure to check out the FPV and night flying rules in your country. The flasher controller reads the PPM signal from the RC, usually a knob or switch position on the transmitter. The range, minimum to maximum is 1000 to 2000 uS; the same as for a servo. No PPM signal flashes a default pattern; usually part of the selected pattern which may be useful when looking for a lost model. The standard plane pattern recognizes a stage between minimum and mid positions and turns on only the red/green navigation lights. This works with a knob control but may not with a 3-position switch unless your transmitter allows full programming of the PPM positions. PPM is the control signal output at the servo channels of RC receivers. 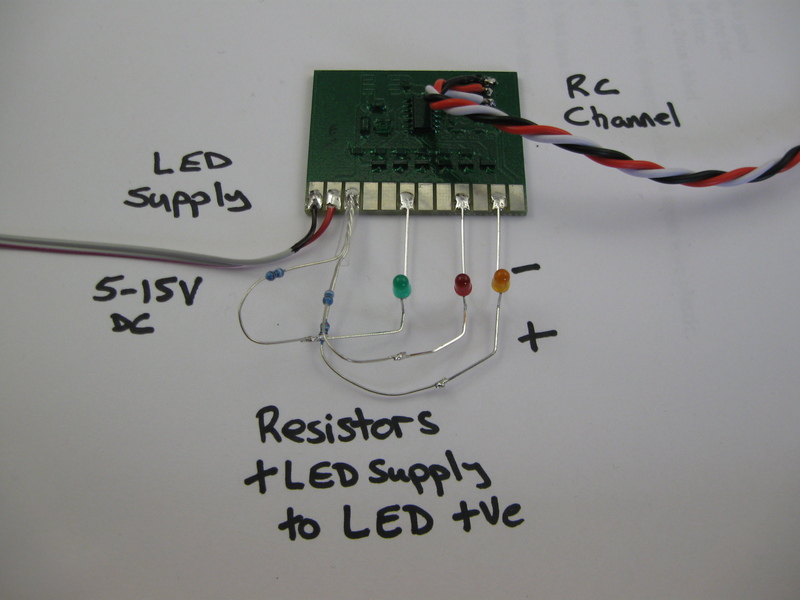 A servo tester can be used to control the LED flasher. A pot or fully programmable switch on your transmitter can select the “minimal lighting” position. A standard 3 position switch may be limited to the standard 3 settings, off, normal-flight and all-on. If the PPM signal is lost during normal operation for more than about 1.5 seconds, the on-board LED flashes rapidly until power is removed. This acts as a PPM failure indication during flight. The small green on-board LED helps with programming and status. During normal operation (not-programming), at power-on there is a short delay then one solid flash, another short delay then a series of 1 to 5 short flashes that indicate the current selected flash pattern. See below for flash patterns. While operating normally the LED gives a brief flash about every 1 second. Rapid flashing after flying indicates there has been a loss of PPM signal at some stage. See the next section for a description of LED operation during programming. The LED flasher will operate without a PPM signal in a reduced flash mode depending on the flash pattern selected. Flashing while no PPM signal is present was intended to assist with finding a lost model. To operate full time without PPM, LEDs required to be permanently on can be connected so as not controlled by the flasher; power applied = LEDs on. There are 5 predefined flash sequences. One can be selected to run whenever the flasher is turned on. It remembers this setting. Using a servo tester or transmitter/receiver, set the PPM to maximum (2000uS) and power-on the flasher. This enables programming mode. You must be able to see the on-noard LED or have an LEDs controlled and powered on channel 6. The on-board LED will give one solid flash once just after power-on, then after a short delay both LEDs (on-board and channel-6) will give 6 quick short flashes then programming mode ends. Immediately after one of the first 5 flashes, quickly set the PPM to minimum to choose that pattern. See the video on our Youtube channel. Note: if ever the flasher is powered-on or reset with PPM near maximum you will enter programming mode. If not wanted, leave the PPM alone while it cycles through the 6 flashes then ends without changing anything or switch off and restart with the PPM set lower. Note: some receivers may delay PPM output at power-on. A servo tester will have to be used if this happens. 1 LED 0V – black LED 0V – black . .
2 LED +V – red LED +V – red . .
3 LED +V – red channel-1 . .
4 channel-1 channel-2 . .
5 channel-2 channel-3 . .
6 channel-3 channel-4 . .
7 LED +V – red channel-5 . .
8 LED +V – red channel-6 . .
9 channel-4 . . .
10 channel-5 . . .
11 channel-6 (prog) . . .
12 PPM . . . 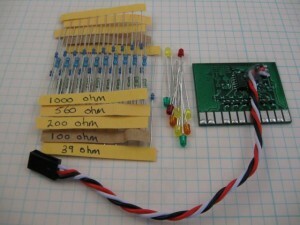 This shows the simplest wiring setup for the Model-A board. LED power comes in on the two-core grey wire from the flight battery on the left. The RC Control wire goes to the RC Receiver; a spare channel. The LEDs are wired +ve side from the LED +ve terminal on the left (3), through resistors, to the output channels 3, 4 and 6. Terminals 3,7 and 8 on the flasher are all connected to LED supply +ve. Connections can be solder pads for light weight RC models or 3.5mm pitch screw terminals for other applications. The extra “LED +V” connections simplify wiring. Slightly smaller but functionally the same as Model-A. Connections can be solder pads for light weight RC models or 3.5mm pitch screw terminals for other applications. The standard version powers the flasher from the PPM lead from the receiver 5 Volts. The LEDs are powered from the LED power connections. This allows higher power LEDs to be fed direct from the flight battery or other power source. To cut down on size weight and cost, the board has solder pads to connect the LED and power wiring. The outputs switch to common (0V, black), so the LEDs are wired from the +V pads to the switched output pads. LEDs can be put in series and/or parallel depending on the LEDs and the LED power supply voltage. For most individual LEDs, resistors are needed to limit the current to a safe level. Most of the LED strips have resistors built in. You can reduce the brightness of LED strips by adding a series resistor; but make sure it can cope with the power or it will overheat. A LED flasher controller can be used to control any flashing lights, even mains powered lighting with suitable solid-state relays. In this case a servo tester and small power supply is needed for full function. We can supply a version of the flasher controller with a 5V regulator on-board. This powers the controller directly from the LED supply. Up to 15 Volts DC. We can also supply a simple servo tester for manual control of the flasher controller for fixed installation.